Shopping for Big Bang Theory Journals? Play rock-paper-scissors-lizard-Spock with your pals! Record your most cogent thoughts and brilliant ideas! 320-page journal derived from The Big Bang Theory. Measures approximately 8-inches tall x 5-inches wide. Play rock-paper-scissors-lizard-Spock with your buds - like Sheldon, Leonard, Howard, Penny, and the gang - or just sit calmly in your little nook, curled up with this The Big Bang Theory Rock Paper Scissors Spock Journal. With 320 lined white pages inside, the hardbound book measures approximately 8-inches tall x 5-inches wide on the outside. There's plenty of space to record your most cogent thoughts and brilliant ideas! 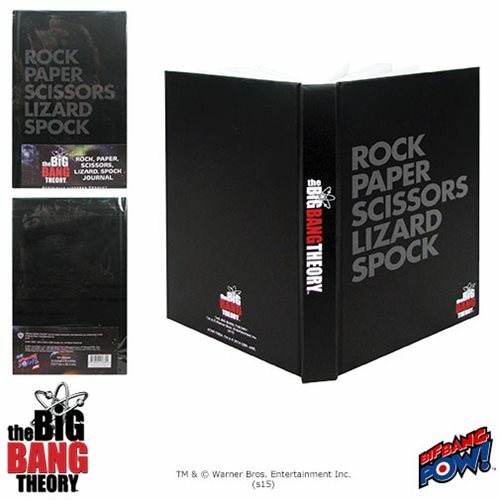 The cover is black, with the words "Rock Paper Scissors Lizard Spock" in gray, while the spine features The Big Bang Theory logo in red, white, and black. Naturally, the back cover sports scientific symbols and a black-and-grey motif. Ready? One, two, three! Ages 14 and up.